4 Ardmore Park. 1 tower. 19 units. Completed: 1994. 4-bedroom units 3164 -3250 sq ft. No maid's room. 4A Ardmore Park. 1 tower. Completed: Around 1990? 20 units covering 33,874 sq. ft of land. 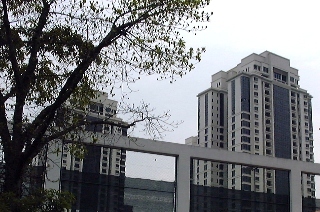 19 units with rental area of 69,620 sq. ft, owned by one corporation. Said to worth $1,300 - $1,400 per sq. ft. Bought at $700 per sq. ft in 1990. 4-bedroom: 297, 327 sq. m.
Swimming pool & tennis court. Covered car park. 24-hour security. Exclusive prestigious address. Near American Club & Tanglin Club. Orchard subway in a 5-minute walk. Low density of 20 units compared to the new Ardmore Park's 330 units. 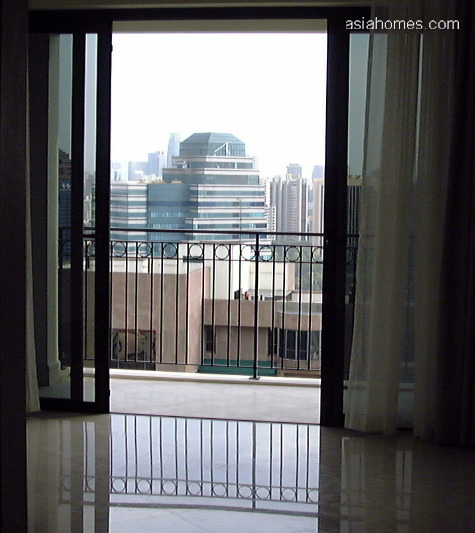 Balcony in 3520 sq. ft units. Wear and tear evident in bathrooms and kitchen of one unit seen. Juniper At Ardmore has a low density feel in contrast to the madding crowd across the road at the 330-unit Ardmore Park. 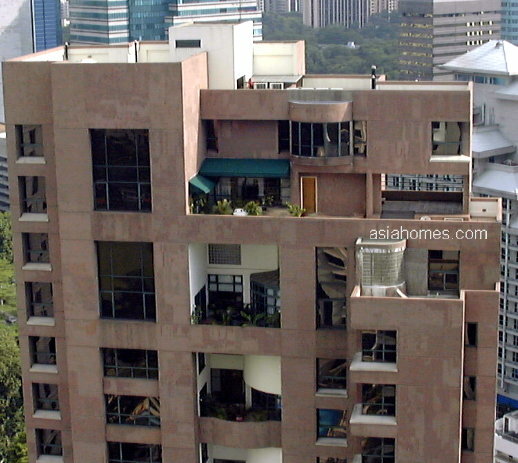 For Rent: 4-bedroom of 3197 sq. ft or 3520 sq. ft asking around $15,000. Facing Ardmore Park condos. Reddish brown marble tiles in the living and dining area. Teak parquet in the four bedrooms. Blue and pink bath tubs. 2 bedrooms have attached baths. 2 bedrooms share a bathroom. All four bedrooms on one side, near a family area. The living and separate dining area is on the other side. Master bathroom is marble tiled and has a shower stall and jacuzzi bath tub. 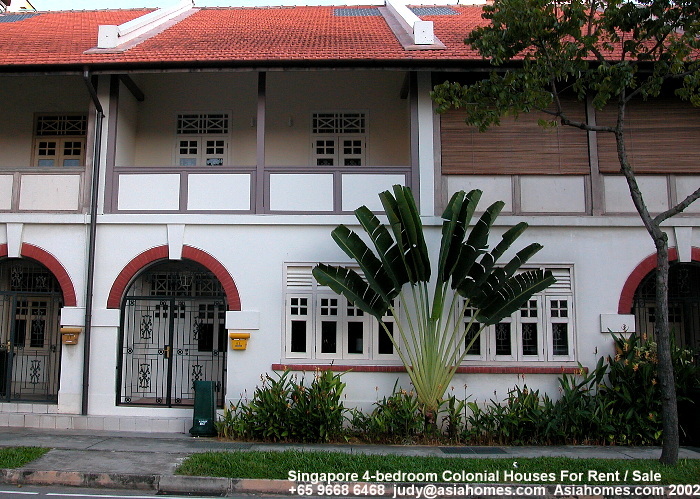 Advert by Realtor: Juniper At Ardmore 4-bedroom 3197 sq ft for rent. Ardmore Park's dining area with a balcony. 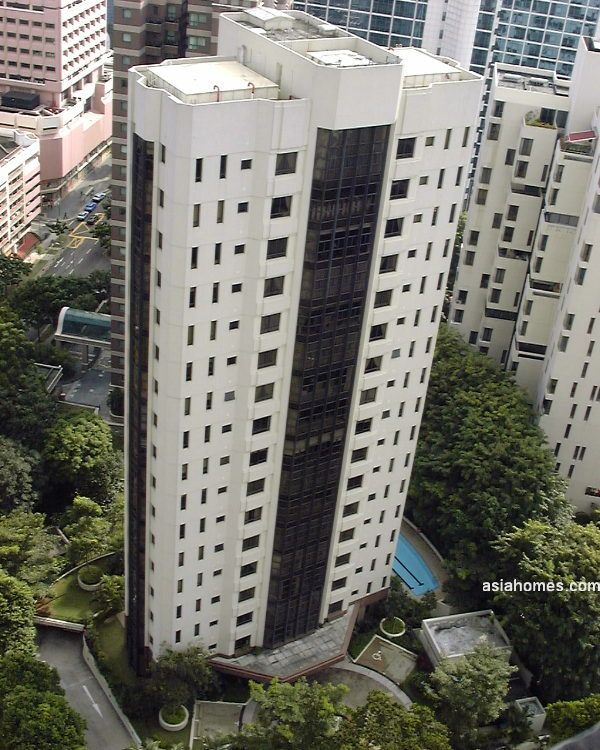 9 Ardmore Park, 25-03 with a city view and a view of the penthouse of Juniper At Ardmore. Rental is around $11,000 as at December 1, 2001. Newer Ardmore Park condos with 330 units. Penthouse of over 8000 sq. ft rents at $40,000. Leonie Condotel has a good sized gym and a large Caucasian community. 5-min walk to Orchard subway. Great demand. Rental from $10,000. Pin Tjoe Court seen from 9 Ardmore Park 16-01 master bedroom. 10th floor available for rent. 4+1 2850 sq. ft with all bedrooms having attached bathrooms. 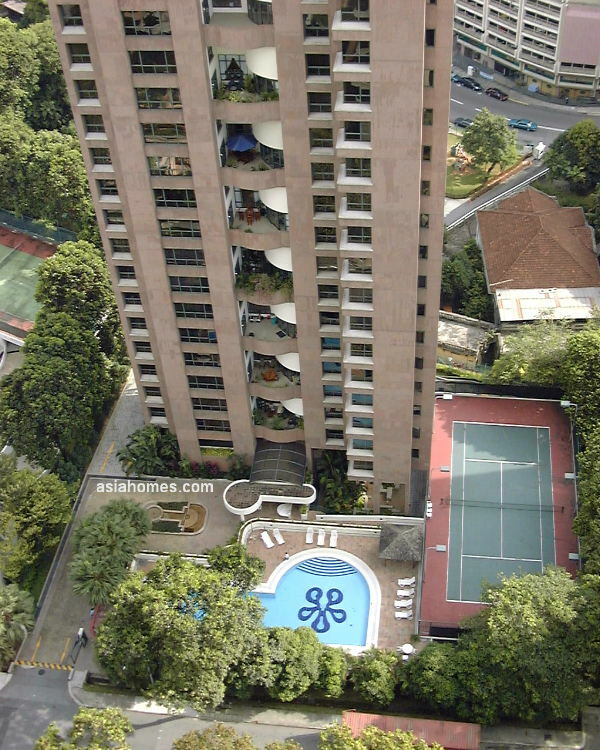 Pool, tennis court, playground, air conditioned gym, security card operated lift. UPDATE IN 2011. Demolished. 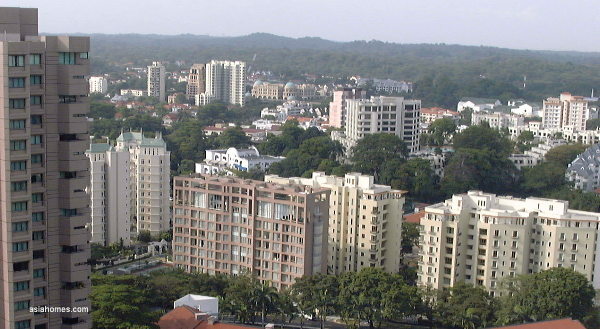 18 Anderson (brown building left, 4-bedroom 2800 sq ft renting $9,000), Chelsea Gardens, Anderson Green (pink building) and Avalon condos (yellowish white building) (bottom, right). The Balmoral (middle tall building above Avalon). 3+1 1679 sq. ft, 4+1 1916 sq. ft. New. 34 units only. 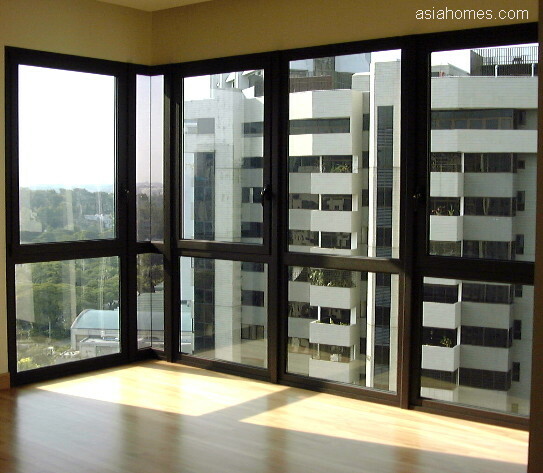 Avalon 2/3+1 bedrooms (1163 - 1765 sq. ft), 3+family+1 2239 sq. ft rent from $5,000 - $10,500. 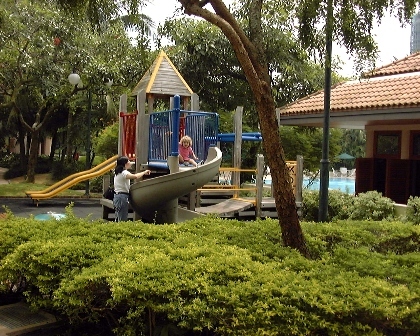 Four Seasons Park has a children's playground near pool. 3-minute walk to Orchard subway. Great demand. 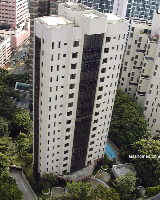 Rental for the 3+1 2260 sq. ft, 4+1+family 2870 sq. ft starts from $10,000. Renovated kitchen of a Habitat I apartment. 3+1 2500 sq. ft $6,000. UPDATE IN 2011. Demolished. New 3 and 4 bedroom apartments and penthouses from 1,787 to 3,864 sq. ft with private lift. 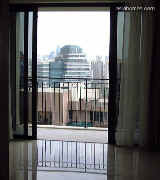 See April 17 2001 house hunting $15,000 downtown condos: Chelsea Gardens penthouse & others. FEW COMPETITORS have over 3000 sq. ft of living space. Ardmore View 4+1 3000 sq. ft $10,000.